Designers use Game Settings to write the text that players will see. This includes: the Game Name; the Game Intro text which appears when the game is first opened; the Game Win Message that appears at the end of a game. There are two other settings here which are good for teaching writing skills. 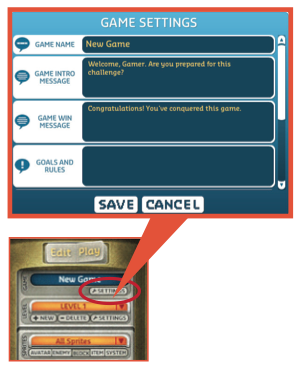 The “Goals and Rules” is a text area where players can write what their game is about, and it is good for communicating the metaphor of a creative game. The “Tips and Tricks” is a good place for designers to think about what their players need to know, and to practice didactic writing skills.